How To Handle Stress from the Barefoot Executive! A Pear-able about Getting Things Done! Want to know how to handle stress and be far more efficient, in general? Below is a post from the Barefoot Executive, Carrie Wilkerson. No, I am not turning into a foodie blog or a cooking blog…trust me ~ this will be about business, goal-setting and life. I’ve recently joined a produce co-op that I love (Bountiful Baskets, if you are curious enough to Google it) and we get the opportunity every few weeks to ‘add on’ something that is in season at a great savings. So, on one particularly ambitious order day recently, I tacked on a case of 36 lbs of pears to my order. My mom raised me to know how to can, preserve and ‘put up’ produce from our garden and the farm stands, so these pears were begging to be made into pear butter and preserves! Yum! Last weekend, right off the bat, I made pear butter and it was delicious! But then the week progressed in a blur and my pears were ripening at warp speed. I just couldn’t manage to ‘fit in’ the time to put the rest of them up. I decided that today (Friday), I would take some time while the kids were in school to jar the old-fashioned preserves, so while I was lying in bed last night, unwinding after a few exhausting days…I pulled up the recipe I had bookmarked. Let me be clear. It was 9:20pm when this hit me. So, I had some choices. I could choose a different recipe that didn’t require the prep. I could choose to wait until today to prep them and delay my preserves until Saturday. I could get up and get it done. You know what I did. I got up. Barefoot and in pajamas, I padded into the kitchen after a grueling few days, already unwound, tired and at this point, maybe even cranky. There were 24 lbs of pears staring at me from the produce box. Daunting to say the least! So, I started ‘chunking down the goal’. I chose a large bowl and decided that would be what I soaked them in. I was NOT going to wimp out and choose a tiny bowl to weasel out of the job. I put about 12 lbs of pears (half of my box) in the sink…it looked like a mountain, but after paring them, I figured they were about right to fill my bowl. I looked at the clock and decided to peel and chop until 10pm, the bowl was full or until the sink is empty – whichever came first! At 10pm, I was relieved and excited!! I could stop! But, guess what?? There were only 3 pears left in the sink and my momentum was such that I could NOT put them back in the box!! I peeled them too!! My bowl was full, my sink was empty, I was SO proud! 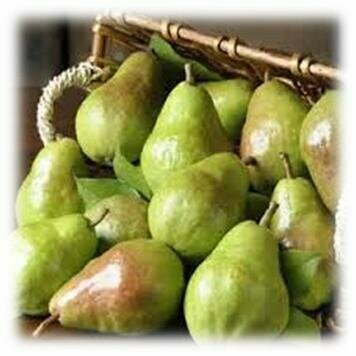 I went to bed THRILLED that I had set that goal, finished the task and could wake up to pears ready to preserve! Wahoooooo! Yeah Carrie! We want to know how to handle stress, too!! Making myself get up and ‘just do it’ – was actually less energy than dreading it, beating myself up about it and delaying it until another day. Because I was fully immersed in pear juice and MESSY…I could NOT talk on the phone, Facebook, tweet, check emails or any other time-wasters. I was FOCUSED on that ONE task to completion. Just Do It – Nike was onto something for sure! The energy of tackling the task is easier than dreading and delaying it. Fully immerse yourself! Turn off incoming distractions. Close your door. Shut down applications. Focus. You deserve it. What are some of your best tips on how to handle stress for whittling away at your tasks? What do you think about bumper goals and mind games? How will you apply this? What is one A-ha you got from this PEAR-able? Carrie Wilkerson, the Barefoot Executive.